So I pulled up 3 smallish turnips and steamed them, along with their greens, with some carrots and garlic. 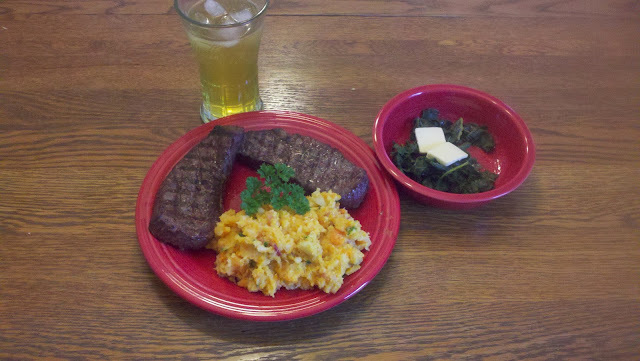 Added some fresh parsley and bacon to the turnips, carrots, and garlic for a great side paired with some grilled steaks. Simmered the turnip greens with the bacon drippings and voila! Good eats! Now I just need to find a few acres to raise my own beef and pork. Baker Creek (www.rareseeds.com) has a number of delicious looking varieties purported to be both sweeter and more complex (some slightly nutty, others richer) than the standard purple tops.